Contrary to the oft-repeated truism, there are churches in America where Sunday is not the "most segregated day of the week," as Sheryl Kujawa-Holbrook convincingly demonstrates in her compelling exploration of congregations tackling racial justice issues. Yet the truism continues to haunt many congregations, and Kujawa-Holbrook reveals, through story and thoughtful analysis, what it means to create and live out multiracial community. Focusing on six congregations from different denominations, geographical regions, and settings, the author shows us the joys and struggles in their intentional pursuits of a more diverse and just community. 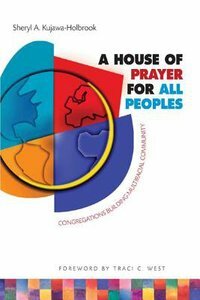 The stories in A House of Prayer for All Peoples will inspire leaders to explore their congregation's history, study their community's demographics, and, most of all, search their souls for ways they can develop and celebrate the diversity in their midst. The book is capped by an extensive annotated resource list for readers who want to explore the topic further. About "A House of Prayers For All Peoples"
The Rev. Dr. Sheryl A. Kujawa-Holbrook (EdD., Columbia University; Ph.D., Boston College, City University of New York is Academic Dean and Suzanne Radley Hiatt Chair in Feminist Pastoral Theology and Church History at Episcopal Divinity School, Cambridge, MA. She is the author of Injustice and the Cure of Souls with Karen B Montagno, By Grace Came the Incarnation: A Social History of the Church of the Incarnation, Murray Hill, New York, 1852-2002 and Deeper Joy: Lay Women And Vocation in the 20th Century Episcopal Church.